This group portrait monument to the pioneers of the woman suffrage movement, which won women the right to vote in 1920, was sculpted from an 8-ton block of marble in Carrara, Italy. 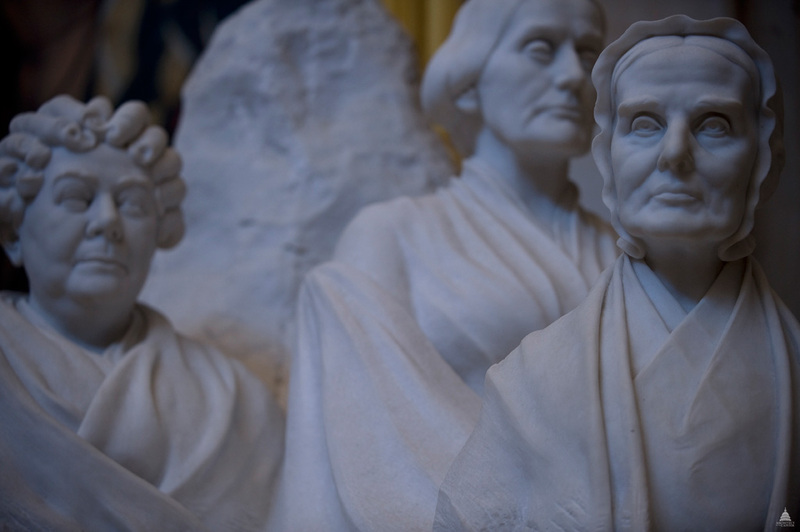 The monument features portrait busts of three movement leaders: Elizabeth Cady Stanton, Susan B. Anthony and Lucretia Mott. 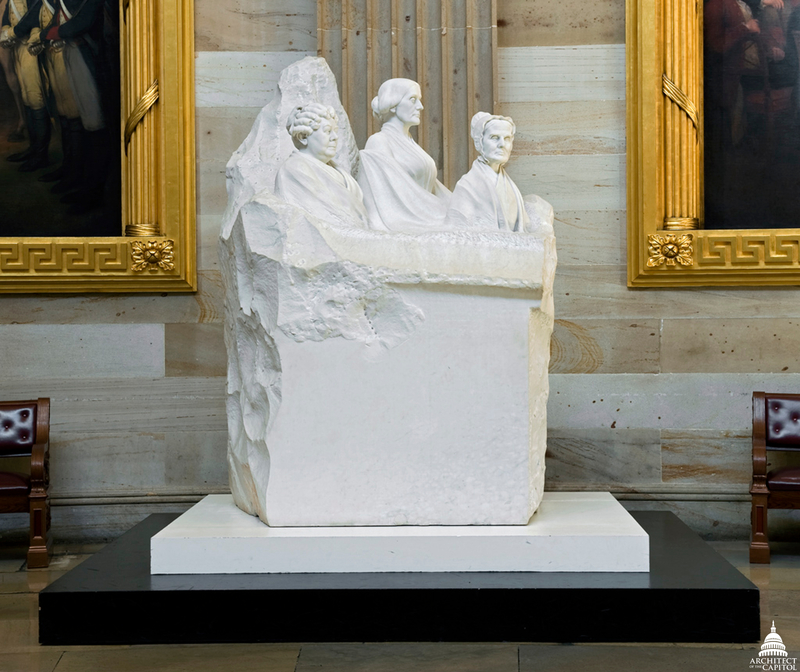 The monument was presented to the U.S. Capitol as a gift from the women of the United States by the National Woman's Party and was accepted on behalf of Congress by the Joint Committee on the Library on February 10, 1921. 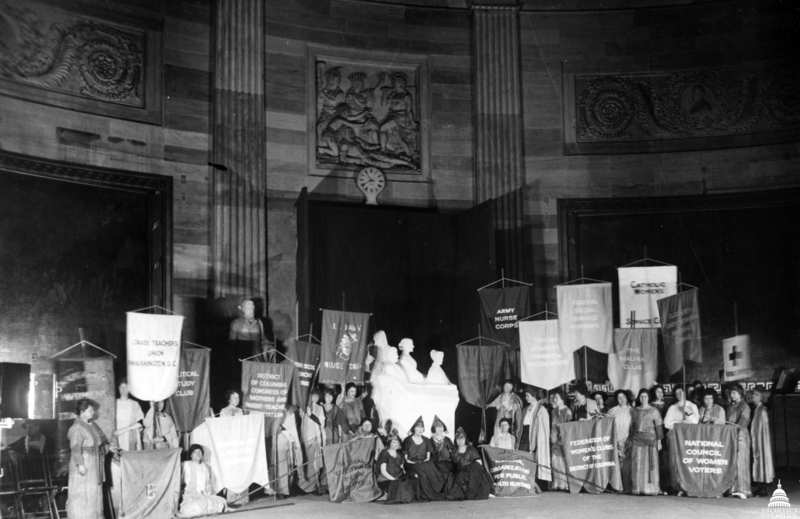 The unveiling ceremony was held in the Capitol Rotunda on February 15, 1921, the 101st anniversary of the birth of Susan B. Anthony, and was attended by representatives of over 70 women's organizations. The Committee authorized the installation of the monument in the Crypt, where it remained on continuous display. In accordance with House Concurrent Resolution 216, which was passed by the Congress in September 1996, the sculpture was relocated to the Rotunda in May 1997. The portraits are copies of the individual busts Adelaide Johnson carved for the Court of Honor of the Woman's Building at the World's Columbian Exhibition in 1893. The detailed busts are surrounded by rough-hewn marble at the top of the sculpture. The monument originally consisted of three parts, the 14,000-pound sculpture itself and two rectangular stone base slabs. The black Belgian marble base and the white Carrara marble base were donated by Johnson in 1925. However, the black marble base arrived broken and was not replaced by the artist until 1929. In 1930 both pieces were installed, completing the artist's design. The total weight of the monument and its two bases was approximately 26,000 pounds. To allow safe placement in the Rotunda, the marble base slabs were replaced with lighter structures designed to resemble them. Elizabeth Cady Stanton (1815-1902), president of the National Woman Suffrage Association from 1865 to 1893; author of the woman's bill of rights, which she read at the Seneca Falls, New York, convention in 1848; first to demand the vote for women. Susan B. Anthony (1820-1906), abolitionist, temperance advocate, and later president of the National American Woman Suffrage Association, who joined with Stanton in 1851 to promote woman suffrage; proposed the constitutional amendment passed many years after her death. Lucretia Mott (1793-1880), Quaker reformer and preacher, who worked for abolition, peace, and equality for women in jobs and education; organizer of the 1848 Seneca Falls, New York, convention, which launched the women's rights movement.